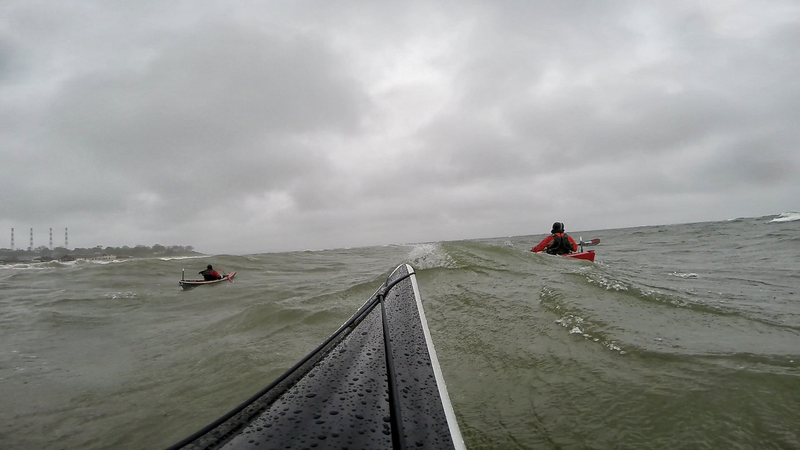 West Isles Sea Kayak Symposium – The symposium you never knew you wanted to go to, but do! 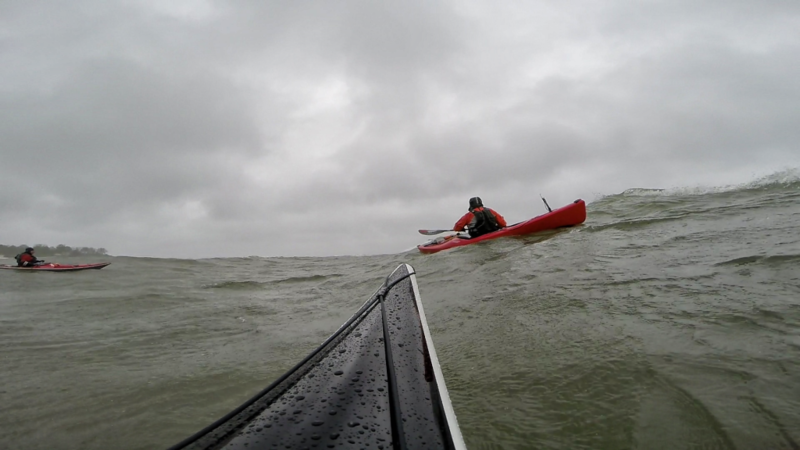 Posted by: Chris King | Comments Comments Off on West Isles Sea Kayak Symposium – The symposium you never knew you wanted to go to, but do! The beginning of September this year found me driving up to New Brunswick Canada, and the magnificent Bay of Fundy for a week+ of exceptional kayaking. We met and stayed with some friends on Deer Island, NB, and then headed to Campobello Island which was the home of the 208 West Isles Sea Kayak Symposium. We spend Friday Saturday and Sunday there although it was only a 2-day event. Those of you who travel or paddle the coast of Maine, will see similar, yet even more dramatic coastlines, and add in the up to 50 foot tidal range of the Bay of Fundy, which can be calm and relaxing or fast and furious for current. Landscape changes as the sea literally falls away or rises up beneath you. We saw no end to harbor and gray seals, pilot whales, minke whales, humpback whales, and porpoises. They were never far from our paths, and at least one seal even bumped into Shannon’s kayak! The courses that are offered span from gorgeous journeys, surfing, rock gardening, working in strong currents, rolling, etc. It need not be a weekend of adrenalin, but it can be if you so want it. The day the event ended we drove to Nova Scotia to test our skills on the Shubenacadie Tidal Bore. While not part of the symposium, the weekend had sharpened our skills and allowed us to really feel much more comfortable in the high speed, big wave craziness of The Shubie. Below is a clip from our friend Ben Fontenot from his GoPro of The Shubie from our trip. Feel free to ask me or Shannon about the experience or logistics! Comments Comments Off on West Isles Sea Kayak Symposium – The symposium you never knew you wanted to go to, but do! I’m off to Michigan to visit the in-laws and won’t be back on the water until January. Over the past few months I’ve been assembling a fairly massive collection of videos and still images from the people I’ve paddled with, and I have finally completed the 2017 Year in Review. It has many folks, in and out of NACK, and a variety of venues. I feel it tells a wonderful (if incomplete) story, and a fun one to watch and tap your feet to. I had a heavy focus on surfing this year, but there are all kinds of trips in here. The NACK Drone certainly added to the mix nicely. I hope that in 2018, we can get some great NACK trips out there to include! I know there are a few special ones already in the works, and look forward to them. Meanwhile, if you have 15 or so minutes, crack open a beer, pour some wine, or brew some coffee, stream the video to your largest screen with the volume up, and enjoy! Thanks for being a big part of my year. A lot of the focus for NACK is on safety. This surprises no one. You’ve likely been on outreach events with NACK like the Belmont Lake State Park Pumpkin Tow, Babylon Kayaking for a Cause, or Captree Dockside Festival, among others. If you haven’t…well, step on up and join the fun! Aside from socializing, running technique demos, and having fun, you’ll often find us conveying the importance of paddling safety, and a lot of focus on PFD use. PFDs and overall basic safety are certainly key, and are an approachable subject for people strolling through our booths and events, but as a NACK member and as a paddler there are far more important safety-related aspects of NACK membership that are often unsaid, so I’d like to take a moment to say them! 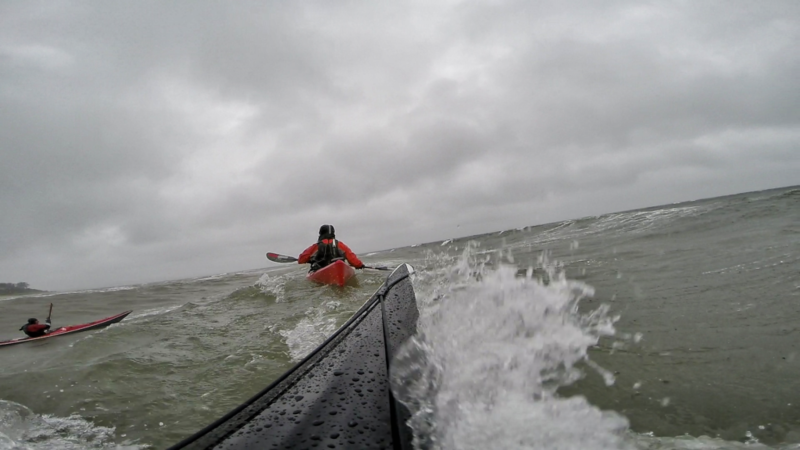 Paddling with NACK we find encouragement to improve skills without pressure to over-extend out of the comfort zone. We are monitoring and aware of each other’s daily limitations be they technical, physical, medical, or mental. We all have on and off days, and often don’t know which they are until we are on the water or in the soup. Our members consistently have proven themselves as sensitive to the sometimes subtle signs of cold, fatigue, fear, anxiety, pain, hunger, and a myriad other things that we encounter while out paddling. We rally behind anyone needing an adjustment to the day—whatever the particular change may be—and there is no negative judgement for it. I find that consistent behavior to lend confidence to each of us, empowering us to make appropriate decisions, and make the most (and safest) of any given day. Sometimes it means we push harder cuz everyone is ‘on’ that day, and other times we draw things back as needed. Some of that trust comes from our efforts at skill building during peer practices, and pool sessions. 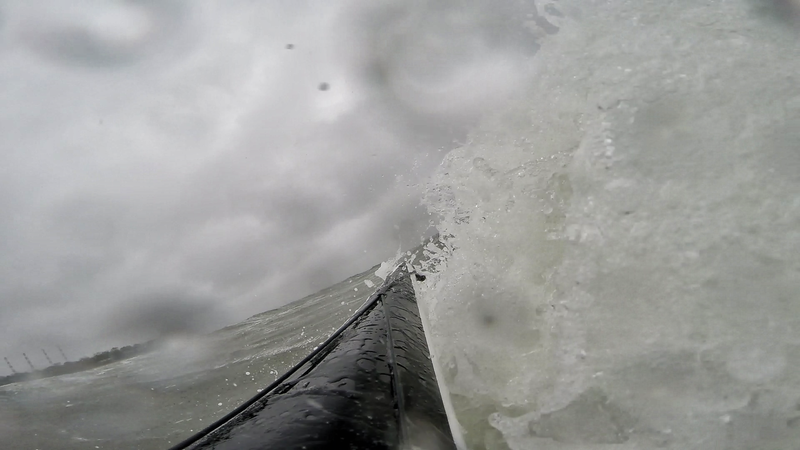 Much of it comes from days out paddling. Not every NACK’er is a frequent paddler, and if you only come out now and then, you may not recognize this benefit to the group, but if that is the case, take a look around you on your next NACK paddle and watch those near you. I think you’ll find that we are all carefully watching each other, and making us all stronger for it. It was a slow year for official NACK paddles, although many of were on the water frequently. I hope to see more of you out on the bays, harbors, rivers, Sound, and ocean soon! I want to spend a few moments sharing my reflections on what NACK means to me. Just what it is I get from it, why, and even how I know it. 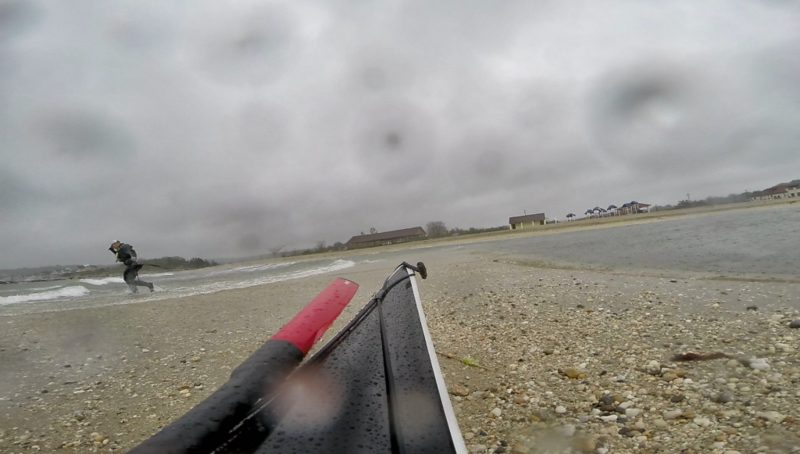 I enjoy many types of paddles from the serene and meditational, to the technical aspects of rolling and boat control, to the raucous fun of ocean surf, and of course the challenging tests of foul weather. 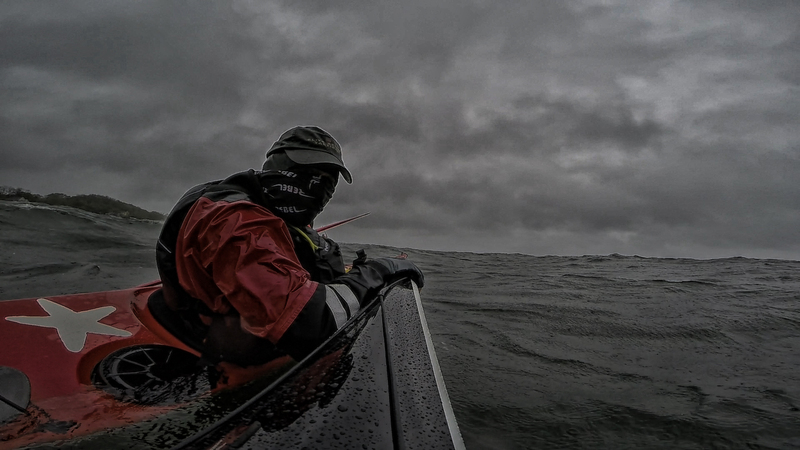 This past weekend I was able to to head out with fellow NACKers Troy & Alan on yet another foul weather adventure. My new Sterling Progression was in hand and I was determined to get it wet. We knew the weather was going to be a beast, and Troy devised an atypical float plan for it. It was going to be a predominantly easterly wind due to the storm, so we parked a shuttle vehicle at Crab Meadow beach, and another at Stony Brook harbor, and we then set out from Stony Brook harbor, out Porpoise Channel into the Sound where we headed out from shore a bit to catch the wind and waves and travel the ~11 miles west back to Crab Meadow. The current flooding in through Porpoise Channel was intense and running against us, and we chose to walk the boats the last half of the way out of the channel as it was less work. Once out of the channel we got back in and set off. As the day progressed the weather worsened as predicted. Winds picked up to a steady 25kt with gusts to 33kt, and driving rain along with it. Waves varied as they always do, but max recorded wave height on the nearest buoy was 4.9 feet. The wave period was listed as 5 seconds, but honestly I don’t believe that they were any longer than 2 seconds. It made for decent travel speed, but not always in the intended direction! 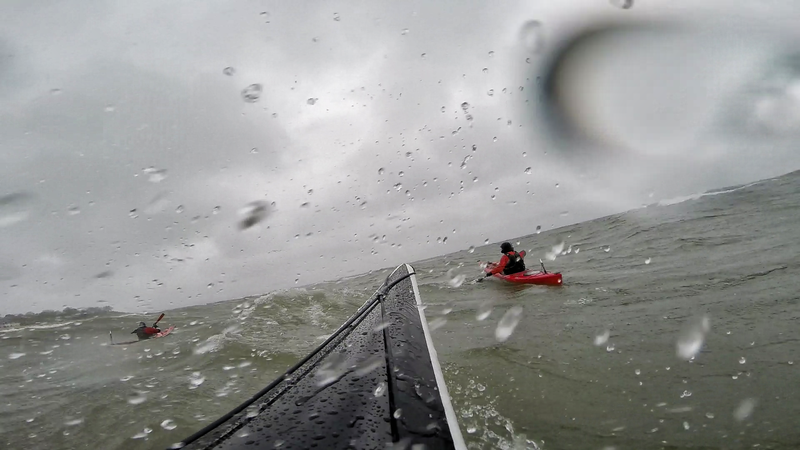 Troy got to test the Dagger Stratos in rough and dynamic water for the first time. Alan’s Rockpool Alaw Bach got another notch in it’s belt, and my Sterling Progression was baptised in the water it was designed for. Now, this post is not just an excuse to relate trip details, but to explain what NACK is to me. NACK provides the framework for us to know each other better as people and as paddlers. It allows us to learn our skills and weaknesses and to improve if we so choose. NACK drives us to excel and to enjoy. Can we do that without the organized group? Of course we can, but the group–THIS group: NACK–facilitates that. It makes it easy to find like minded folks to relax, and also push our limits, and a place to come back after and tell our tales. For these things I am grateful. For the opportunity to learn from you all and to teach you anything I may know–or think I know! A trip like the one described above makes it easy to see the benefits. It ensured that we all knew each others limits, and how far beyond the comfort zone we each were interested and willing to go. It threw us each differently into adversity. And allowed us each to rise to the challenge and also rise to deal with each other’s adversity! For my part, I was out of shape due to coming off of a back injury and not getting any exercise for weeks. So I was weak, and also tired quickly. Managing my blood sugar as a type 1 diabetic is always hard, and long periods of exercise make it more complicated. My mates knew both my condition and my needs and as always kept a watchful eye on me. It is no small task to monitor a diabetic on the water, and knowing that they’d challenge me and care for me is n incredible thing to have. It is never easy to accept one’s limitations, but not doing so endangers others, so I take it seriously and they trust me to do so. So in the midst of all the rain and wind and waves, and reflecting waves, and diving and climbing blood sugar, I still am spending time watching and evaluating the conditions of my fellow paddlers and ensuring that I am in a condition where I can assist them if and when needed. As noted earlier, it is easy to have clarity of these things when trying to navigate the crashing 3+ foot waves that are trying to throw you at the paddler who is out of their boat in the surf zone, and the 25kt wind pushing everyone around. But it also allows me to have the clarity that the reason we are confident enough to test ourselves in those conditions are all the days spent with all of NACK floating, paddling, rolling, chatting, and eating. And again…for that I am grateful. So thanks to Troy and Alan for the trip, and thanks to all of you for being part of the family that makes it possible. I’ve attached a few stills that the GoPro recorded from the day. As always, the camera doesn’t capture the real feel. You can’t see or feel the wind, the waves look half their height, and the dynamic motion of the water is hidden. But the discerning eye can still interpret it. You can note the height differences between paddlers even though the waves look somewhat flat. You can see the foam pile up over my head while side-surfing a breaking wave to get myself out of the way of the swimmer. 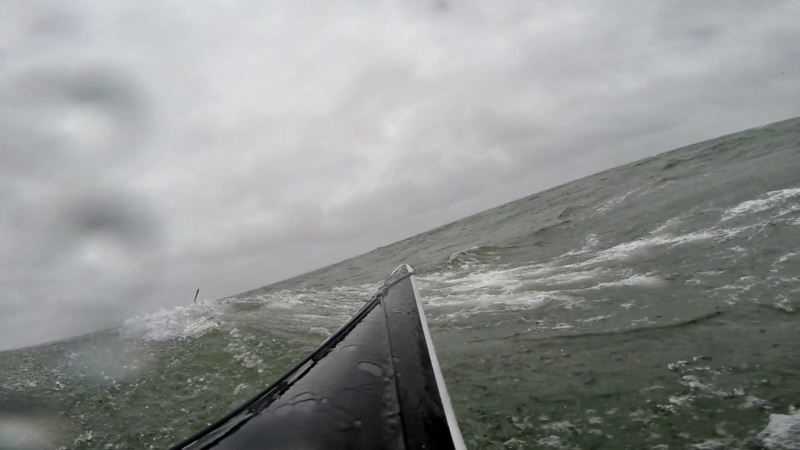 You can see the lean into the wind after I dumped my boat on a sandbar to run back through the surf to ensure paddler and boat were safe and not drifting free. Bonus – now I don’t have to worry about getting my first scratches on the gelcoat! At about 5:30am on February 11th, I loaded the kayak on the car with the help of my wife, before driving her to the train station. We set out pre-coffee, and my brain shifted into autopilot as if it were my normal commute. Add to that, that we were running tight on time for her to make her train. With my focus on getting her to the platform steps asap, it never occurred to me that I even had the boat on the car as I entered the parking structure, and the clearance bar caught under the bow of the boat. It pried the bow up until the front of the boat flexed enough to allow the bar to snap free. The front hatch completely blew off, the deck seam split in the bow, and the interior seam tape delaminated in various spots from bow to cockpit. And a few long cracks around the deck and hull to boot. Thankfully I did not have bow lines on or I’d also have a bent hood, and other damage to the front end of the car. The crossbars on the outback bent with the pressure, but they didn’t fail either. Homeowner’s insurance is covering the boat (minus the deductible), and a replacement Progression is already being hand made for me. Alan helped me bend the crossbars back, and more or less…all is well. The takeaway of this sad tale is simply to remain aware of where you are and what is on your roof! I put the video together as a part of my emotional healing process. As you can imagine…I too was a bit of a wreck! 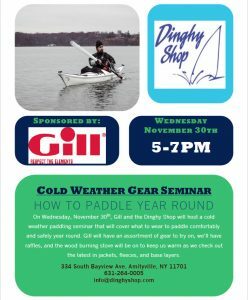 On November 30th the Dinghy Shop will be hosting a Cold Weather Paddling Gear Seminar sponsored by Gill, makers of some great paddling and all around outdoors clothing. There will be a seminar by Mike and Paul covering year round layering and what to wear in a variety of conditions. We’ll have a showcase of the new Gill 2017 gear line up from the latest hydrophobic fleece, base layers, light weight jackets, drysuits, and more. There will be gear to try on and all Gill will be on sale. Whether you paddle year round or just in the warm months, Gill has the right gear to keep you safe and comfortable. Join us from 5pm – 7pm on 11/30 for the seminar, raffles, and fun around our wood burning stove. All are welcome. Click the image below to see their flyer for the event. I’d like to share the wonderful compilation that Kayak Hipster (a.k.a. Luke Rovner) edited which gives a great visibility into the Hudson River Greenland Festival. For those of you who haven’t gone, it makes for a fantastic, inexpensive and nearby getaway in June with some really lovely people. Rather than blab on here about it, I’ll let Luke and his subjects do it for me!